Brides-to-be are always looking for that one feature that will make their wedding most memorable to their guests, and yet are conflicted to stray away from traditional aspects. For instance, the wedding cake; when dreaming of their wedding, many brides picture the 5 tiered, butter creamed, and fondant flower adorned cake. However, many couples are now opting away from the full-sized cake, and instead choosing to have an interactive dessert station. There are many benefits to having a dessert station versus a traditional wedding cake, first being overall value. On average, wedding cakes cost over 500 dollars, and only increase when you add different flavors or intricate designs. If price is something that is important to you, switching to simple pastries or cupcakes can help with your budget. If you are more concerned with the best value for your buck, assorted desserts is the way to go. While you are only getting one or two flavors of cake, you can get a wide variety of different mini desserts for the same dollar value. Wouldn’t you much rather have choices of many options rather than one or two? Your guests will feel the same way! Creatively, there are endless amounts of ways to make a dessert station that statement piece you have been looking for. Whether it is choosing fun linens, using a mixture of different serving pieces, adding flowers, or incorporating some aspects from your theme, dessert stations really add that “wow” factor. At The Essex Room, we have had a wide variety of different looks. We have found that using mix-matched serving plates adds dimension and height to the table. Also, the more lights, the better! Stringing fairy lights along the table add a whimsical feeling, and still make the table pop when the lights are dimmed for dancing. Budget friendly, better tasting, and a beautiful statement; a win, win, win. One of our more popular themes last year was rustic. We used a natural flax linen, with a variety of different wood stands, including a wooden multi-tiered cupcake tower. Additionally, we mixed in some white formal stands to create a balance between rustic and romantic. By adding some moss and various greens, the table truly made a statement, and tied the theme together with the entire room. If you are looking to do something a little more unique, incorporate some DIY decorations such as paper windmills, tassel garlands, and festive signs. Vary the heights of the signs to add some playful dimension to the table. Another way to add flare is by having some flavors and desserts that represent you, such as old family recipes or dishes that are traditional to your nationality. Again, by choosing a dessert station, it is easy to incorporate these aspects. Cannoli, tiramisu, biscotti, and zabaglione are just a few of the classic Italian dishes that the Essex Room’s chef and baker duo, Ned and Lucinda Grieg, can prepare for your wedding. If you have a recipe from a great grandparent that you wish to use, Ned and Lucinda would love to help. If you have a little room left in your budget, the dessert station is a great place to invest in decorations. The beauty of using mix matched serving pieces and platters is you can find some great items at low costs. In addition to low cost home good stores, check out used wedding decor websites for items other brides used for their wedding, and are selling at a discounted price. Some great examples include www.wedding-recycle.com and www.bridalgaragesales.com, among others. 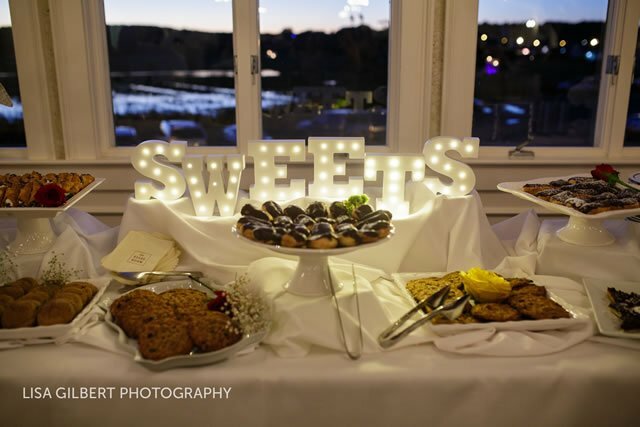 You can also save money, but still have the same impact, by sticking with standard linen for your guest tables and upgrading the linens on your statement tables such as the sweetheart, cocktail, and of course, the dessert station. One of the higher expenses of a wedding is the flowers, and yet, after the ceremony the bouquets often get lost. Give them a second life by incorporating them into your dessert station. Lay them flat under the dessert stands to add a pop of color to the table, or give them height by standing them up in tall vases. If you are still having trouble letting go of the traditional aspect of a wedding cake, such as the classic cake cutting picture, there are ways around it. By getting a simple ceremonial cake and adding it to your station, you can have the best of both worlds. Another new trend we have been seeing is a non-traditional cake cutting photo, where the bride and groom toast ice cream cookie sandwiches, or whatever type of dessert they choose. It makes a great photo, and the sweets aren’t so bad either!